At Celibre Medical Corporation, we offer three different and distinctive types of laser resurfacing. Depending on your skin type, what you want to treat (fine lines, acne scars, pigmentation), the severity of the problem and what downtime you have available, we can help you determine which type of treatment (or series of treatments) is right for you. 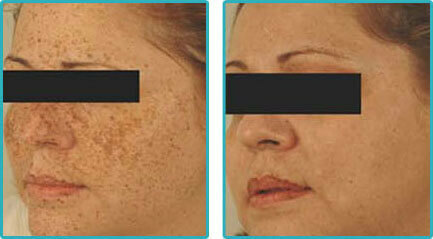 Fractional Laser Resurfacing: We use the Sciton Profractional (similar to Fraxel) for these treatments. This laser ablates or removes tissue but does so in a fractionated manner. This means that you will have a “grid-like” pattern of injury on your skin. By not removing the entire outer layer, you can drastically cut recovery time. Most patients are back to work and social activities in about 4-7 days. This laser also damages or ablates the deeper layer of skin too, which helps your body make more collagen. This will help your skin look smoother and firmer. This treatment is excellent for fine lines, acne scarring and surface pigmentation. Full Field Laser Resurfacing: This treatment also uses the Sciton Profractional, but is a complete removal of the top layer of skin, almost like a superficial peel. Because this laser ablates, it also creates heat or thermal injury as well. Thermal injury occurs in the dermis or deeper layer of skin that produces collagen. So with both the fractional and full field laser resurfacing, you will get some collagen stimulation, which makes the Sciton Profractional a great laser for treating fine wrinkles, acne scarring and sun damage. Again, you can count on about 4-7 days of downtime with this treatment. Non-Ablative Resurfacing: This treatment is a little different from the other two discussed above. This laser only uses thermal injury and doesn’t ablate or remove any outer layers of the skin. The thermal injury will still stimulate collagen production because it’s a precise and controlled stress or injury to the skin, but it doesn’t have any downtime since there’s no injury to the surface cells. The downside, however, is that the results of this laser can be less dramatic than those of the other two types of treatments. A series of treatments may be what’s needed to give you the full results your looking for, but it’s a great option if you have little or no time to spare on recovery. We would love to discuss which of our resurfacing lasers is right for you. Every consultation with one of our laser resurfacing specialists is absolutely free. We welcome your questions about these treatments and look forward to creating a treatment plan that’s perfect for you! Contact us today to schedule a FREE Laser Resurfacing consultation!